We report research into associations between the school-level and classroom-level environment in science classrooms in South Africa. An instrument, developed to assess students' perceptions of their classroom learning environment as a means of monitoring and guiding changes towards outcomes-based education, was administered to 2,638 Grade 8 science students from 50 classes in 50 secondary schools in Limpopo province. In addition, the teachers of each of the 50 classes responded to a questionnaire developed to assess factors in the school-level environment (such as the adequacy of resources, parental involvement and collegiality). Thedata collected using the two questionnaires were analysed to examine whether the environment created at the school level was linked to the likelihood of teachers successfully implementing outcomes-based education at the classroom level. In countries around the world, there has been much attention given to the benefits and problems related to outcomes-based education (OBE). Although the media, politicians, educators and parents all seem to have opinions about outcomes-based education, unfortunately very little of this is based on any evidence. The dearth of literature and research related to the implementation of outcomes-based education makes it difficult for various stakeholders to make informed decisions and to form opinions that go beyond anecdotal or subjective information. The history of OBE and its adoption around the world was traced by Steiner-Khamsi (2006). She found that the overhaul of New Zealand's public sector, which ended in the State Sector Act of 1988 and the Public Finance Act of 1989, had important consequences for the education sector by emphasising outcomes-based accountability. At this time, as part of ongoing market-driven reforms, there was introduced in the United Kingdom (UK) a new national curriculum that embodied the language of "public accountability, effectiveness and market regulation" (Steiner-Khamsi, 2006:688). The outcomes-based reforms that took place in New Zealand (Bell, Jones & Carr, 1995) had much in common with curriculum reforms that took place in the United Kingdom (also known as competency-based education) (e.g. Faris, 1998), Australia (Aldridge, in press), Canada (Hopkins, 2002), South Africa (Botha, 2002) and, for a brief period, the United States (also known as performance-based education) (e.g. Evans & King, 1994). Countries around the world have been adopting outcomes-based education as a model for reform in school and post-school education and training systems. The present study undertaken in South Africa's Limpopo province examined the classroom-level and school-level environment developed in line with the education goals of OBE as specified in Curriculum 2005 (C2005; Department of Education, 1996). Historically, schools have been viewed as organisations, operating similarly to other social groups in that they have their own goals, rules and regulations, roles, hierarchies of authority, forms of compliance, and communication patterns (Dorman, 1998; Dorman, Fraser & McRobbie, 1997). These aspects constitute the school environment which has been linked to teacher self-efficacy, productivity and satisfaction in the workplace (Organisation for Economic Co-operation and Development, 2009). To date, however, little research has been carried out to help administrators and teachers to assess and improve the environments of their own schools. Studies by Brookover, Schweitser, Schneider, Beady, Flood & Wisenbaker (1978) and Vyskocil and Goens (1979) have shown that the school-level environment could influence student cognitive outcomes, values, personal growth and satisfaction. Cohen, McCabe, Michelli & Pickeral (2009) used a range of research methods (including historical analysis, review of literature and a policy scan) to examine the relationship between school climate and educational policy, school improvement practice and teacher education. In examining school climate with respect to school improvement guidelines, the research indicates that a range of fields (such as risk prevention and health promotion) have identified aspects of the school environment that promote school success for students (Anderson, Thomas, Moor & Kool, 2008; Cohen et al., 2009). In two other studies, relationships between the school-level and classroom-level environment were investigated. 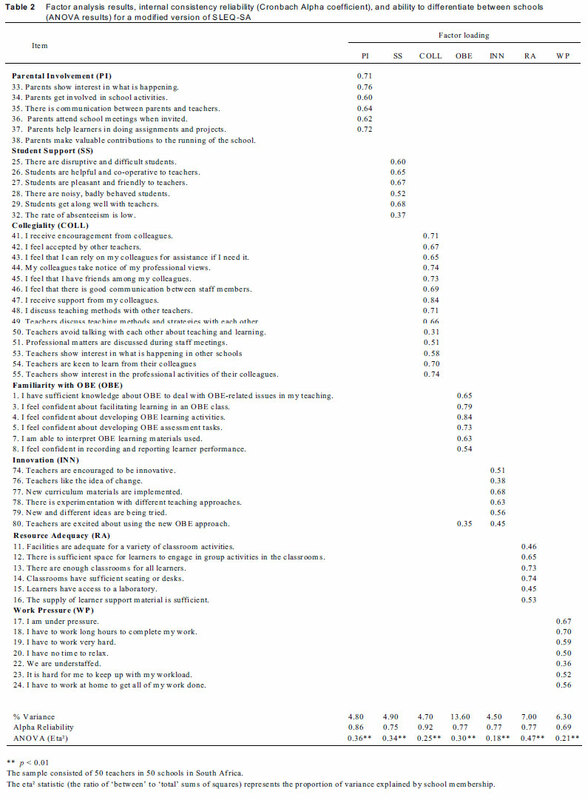 Fraser and Rentoul (1982) used a sample of 34 teachers to obtain data on their perceptions three school environment dimensions (affiliation, professional interest, achievement orientation) and five dimensions of the classroom-level environment (personalization, participation, independence, investigation, and differentiation). The study revealed that links between the two environments do exist. In contrast, a second study by Dorman, Fraser and McRobbie (1995) concluded that the school-level environment does not necessarily transmit to the classroom environment. In the light of these previous studies, we undertook a study of whether teachers' perceptions of the school-level environment influence the learning environments that they create in their classrooms. Freiberg's (1999) book, School Climate, identifies numerous instruments and a range of alternative measures that can be used to assess the school-level environment. One such instrument, the School-Level Environment Questionnaire (SLEQ, Fisher & Fraser, 1991a; 1991b) was designed to assess school teachers' perceptions of psychosocial dimensions of the environment of the school. Versions of the SLEQ have been used successfully in Nigeria (Idiris & Fraser, 1997), South Africa (Aldridge, Laugksch & Fraser, 2006a), Rwanda (Earnest & Treagust, 2001a; 2001b), the US (Johnson & Stevens, 2006; Johnson, Stevens & Zvoch, 2007) and Taiwan (Huang & Fraser, 2008). Past research on school-level environment has involved school improvement (Fisher & Fraser, 1991a; Templeton & Jensen, 1993), patterns of transition during middle school (Chung, Elias, & Schneider, 1998), teachers' perceptions of their work environment (Fisher & Grady, 1998), teacher morale (Young, 1998), gender differences (Huang et al., 2008), effects on student outcomes (Anderson, Thomas, Moore & Kool, 2008; Johnson & Stevens, 2006) and evaluating school-based interventions (Fraser, Williamson & Tobin, 1987; Wahyudi & Fisher, 2006). The SLEQ was selected as a starting point for the development of a questionnaire, designed specifically for use in South Africa (Aldridge et al., 2006a). This questionnaire and its validity are described below. There has been very limited learning environment research conducted in Africa in general, and in South Africa in particular. In fact, learning environments research in Africa has only been conducted in Nigeria, Rwanda, and South Africa. For the sake of completeness, all of these few studies are summarised below. In Nigeria, Idiris and Fraser (1997) developed an instrument to investigate associations between the classroom environment and student outcomes in agricultural classes. Agriculture, a compulsory subject for junior secondary school students, is the main revenue source for the country. Administration of the questionnaire to 1,175 students in 50 classes from 20 schools revealed a low level of student centredness, negotiation and differentiation. The study also indicated that Nigerian learners would prefer low levels of each of these scales in their learning environment (Idiris & Fraser, 1997). In the second study carried out in Nigeria, the Socio-Cultural Environment Scale (SCES) was used in investigating the perceptions of 328 distance-education learners (Jegede, Agholor & Okebukola, 1995) in terms of the socio-cultural climate of non-western science classrooms. This study also included a student sample from the Caribbean and Asia. The results revealed a significant difference between the perceived and the preferred classroom climate in each of the regions. Earnest and Treagust's (2001a; 2001b) study of school-level environment in Rwanda involved assessment of four dimensions of school environment. A sample of 125 teachers perceived a limited amount of work pressure, a lack of resources, low affiliation between staff members, and a great deal of staff freedom. During the 1990s, research in South Africa commenced with the work of Adams (1996; 1997) on laboratory classroom learning environments. Since that time, there have been only a handful of studies related to the field of learning environments that have been conducted in South Africa (Aldridge, Fraser & Ntuli, 2009; Aldridge, Fraser & Sebela, 2004; Marjoribanks & Mzobanzi, 2004). Marjoribanks and Mzobanzi (2004) examined whether family background moderated relationships between learning environments, goal orientations and students' interest in music. The sample included 210 student from rural communities in the Eastern Cape and 415 students from metropolitan Cape Town. All were black students with a mean age of 17.7 years and whose main language was IsiXhosa. The results indicated that students of parents with lower aspirations had significantly less interest in music than did students with high-aspiration parents. The results also showed that the learning environment had significant associations with students' interest in music. Aldridge et al. (2004) investigated how teachers could use feedback based on students' perceptions of the learning environment in conjunction with reflective journals to assist teachers to become reflective practitioners. A sample of 1,864 learners in 43 classes was used in investigating whether the instruments involved in the study were valid and reliable. During a 12-week intervention phase, two teachers used profiles (based on students' feedback data) to assist them to develop strategies aimed at improving the constructivist orientation of their classroom learning environments. It was found that teachers were able to use feedback from students to guide changes in their pedagogical practices. Also, reflective journals were found to be useful for teachers as they implemented strategies aimed at enhancing the learning environment. A study by Aldridge et al. (2009) involved the administration of a learning environment instrument to the primary school students (N = 1,077) of 31 distance-education primary school teachers who used feedback about discrepancies between learners' actual and preferred learning environment to guide changes in their classroom practice. During a 12-week intervention phase, qualitative information was collected to provide in-depth insights into and descriptions of three case-study teachers. The results indicated that, to varying degrees, the teachers were successful in their attempts to improve the learning environment. In our study, we collected classroom-level environment data from 2,638 Grade 8 science students from 50 classes in 50 secondary schools in Limpopo province, South Africa, to coincide with the first implementation of an outcomes-based curriculum in the secondary phase.) In addition, the 50 science teachers of each of these classes responded to a school-level environment questionnaire. Of the 50 schools, 37 were rural schools, nine were township schools and four were urban schools. These schools can be considered to be a representative sample of the range of schools located in this part of South Africa. 1. Examining the Curriculum 2005 and national and international literature on outcomesbased education (OBE) to identify dimensions central to the educational philosophy of OBE. 2. Conducting interviews with science curriculum advisors and with Grade 8 science teachers to ensure that the scales were considered salient to contemporary educational reforms and the school context. 3. Selecting and developing scales that would cover the dimensions that are consistent with Moos' (1979) scheme for classifying the dimensions of any human environment: (i) Relationship dimensions (measuring the degree of people's involvement in the environment and the assistance given to each other); (ii) Personal Development dimensions (measuring the kind and strength of the personal relationships in the environment); and (iii) System Maintenance and System Change dimensions (measuring the degree of orderliness, control and responsiveness to change in the environment). 4. Relevant dimensions and items for the actual form were adopted and adapted from widely used general classroom environment questionnaires such as the What Is Happening In this Class? (WIHIC) questionnaire (Aldridge, Fraser & Huang, 1999), Constructivist Learning Environment Survey (Aldridge, Fraser, Taylor & Chen, 2000; Taylor, Fraser & Fisher, 1997) and Individualized Classroom Environment Questionnaire (Fraser, 1990). 5. For the student questionnaire, items and instructions were translated into Sepedi (or North Sotho), the local vernacular, and provided alongside the English version as English is the second language for the majority of students in the Limpopo Province. 6. Finally, both questionnaires were field-tested, and subsamples of students and teachers were subsequently interviewed about the clarity and readability of the items. Respondents were asked to indicate during the completion of the questionnaire any possible misunderstanding by underlining unfamiliar words or phrases used in the items. After the completion of the questionnaires, a number of respondents were chosen at random and interviewed. These interviews were aimed at understanding the possible difficulties that respondents may have had with the instructions and the items on the questionnaires. Students were also asked to what extent the translation of the items and instructions from English to Sepedi helped them to understand the questionnaire. (a) Permission to conduct research at public schools in Limpopo province was obtained from the Limpopo Department of Education which subsequently addressed a letter to principals and teachers to this effect. (b) Before administering the questionnaires, detailed instructions were given to the students and teachers. Respondents were also informed that the completion of the questionnaires was confidential and voluntary, and that they had the option to withdraw from participation in the study. (c) The names of the students, teachers and schools were kept confidential. Theoriginal (i.e. unmodified) classroom-level instrument, the Outcomes-Based Learning Environment Questionnaire (OBLEQ), has seven scales with eight items per scale. Included in the OBLEQ were scales (from existing instruments) considered to be of relevance to the philosophy of outcomes-based education, as well as a newly developed scale, Responsibility for Own Learning. The seven scales of the OBLEQ are: Involvement (the extent to which students have attentive interest, participate in discussions, do additional work and enjoy the class); Investigation (the extent to which emphasis is placed on the skills and processes of inquiry and their use in problem solving and investigation); Cooperation (the extent to which students cooperate rather than compete with one another on learning tasks); Equity (the extent to which students are treated equally and fairly by the teacher); Differentiation (the extent to which teachers cater for students differently on the basis of abilities, rates of learning and interests); Personal Relevance (the extent to which teachers relate science to students' out-of-school experiences); and Responsibility for Own Learning (the extent to which students perceive themselves as being in charge of their learning process, motivated by constant feedback and affirmation). Students were requested to respond to items of the modified OBLEQ on a five-point frequency scale with the alternatives of Always, Often, Sometimes, Seldom and Never. A listing of the items contained in the final version of the OBLEQ is provided in Table 1. The relevance of each OBLEQ scale to outcomes-based education, according to Curriculum 2005 (Department of Education, 1997), can be found in Aldridge et al. (2006b). Using OBLEQ data collected from 2,638 students in 50 classes, we conducted principal axis factoring followed by oblique (direct oblimin) rotation (selected because the factors in the set of learning environment scales are expected to be correlated, Coakes & Steede, 2000). At this stage, items were omitted and the two scales of Investigation and Involvement came together, suggesting that this sample of students regarded these two constructs in similar ways. For the remaining items, all items had a factor loading of at least 0.30 on their own scale, and no other scale, with the exception of Items 34 and 35 from (from the Differentiation scale) that did not have a loading of at least 0.30 on their own or any other scale. Table 1 reports the factor loadings for all items in the refined version of the OBLEQ. The percentage of variance varied from 3.13% to 13.66% for different scales, with the total variance accounted for being 35.70%. The internal consistency reliability (Cronbach alpha coefficient) for the OBLEQ scales ranged from 0.62 to 0.79 with the individual as unit of analysis (see the bottom of Table 1). An analysis of variance (ANOVA), with class membership as the independent variable, was used to determine whether each OBLEQ scale was able to distinguish between the perceptions of students in different classes. The results reported at the bottom of Table 1 indicate that each OBLEQ scale differentiated significantly (p < 0.01) between classes. The eta2 statistic (a measure of the proportion of variance accounted for by class membership) for the OBLEQ ranged from 0.08 to 0.13 for different scales. Overall, results suggest that the Outcomes-Based Learning Environment Questionnaire (OBLEQ) is valid and reliable when used in high school science classes in South Africa. The School-Level Environment Questionnaire (SLEQ, Fisher & Fraser, 1990) was drawn on for our study in South Africa. In addition to scales from the SLEQ, two new scales were developed for use in South Africa (namely, Parental Involvement and Familiarity with OBE), as they were considered to be relevant to the successful implementation of OBE by school management teams and teachers. The final version includes seven scales, namely, (1) Parental Involvement (the extent to which parents are involved in their children's education at both an individual and school level); (2) Student Support (the extent to which there is a good rapport between teachers and students and students behave in a responsible and self-disciplined manner); (3) Collegiality (the extent to which teachers can obtain assistance, advice and encouragement and are made to feel accepted by colleagues); (4) Familiarity with OBE (the extent to which teachers have been trained to use teaching and assessment strategies associated with OBE); (5) Innovation (the extent to which teachers discuss professional matters, show interest in their work and seek further professional development; (6) Resource Adequacy (the extent to which the support personnel, facilities, finance, equipment and resources are suitable and adequate); and (7) Work Pressure (the extent to which work pressure dominates the school environment). Teachers were requested to respond to items of the modified SLEQ on a fivepoint frequency scale with the alternatives of Almost Never, Seldom, Sometimes, Often and Almost Always. Using data collected from a sample of 403 teachers from 54 schools in South Africa, validity statistics for the SLEQ-SA were calculated (Aldridge et al., 2006a). 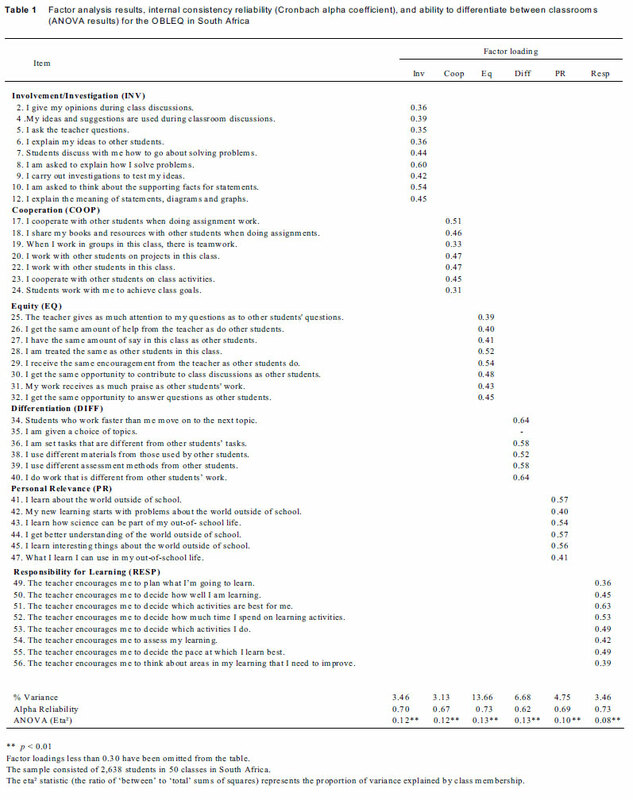 Table 2 provides each item's wording and factor loading and each scale's percentage of variance, Cronbach alpha coefficient and results of ANOVA for school membership differences (the ability of each scale to distinguish between the perceptions of teachers in different schools). Principal components factor analysis resulted in the acceptance of a revised version of the modified SLEQ-SA comprising 51 items in seven scales. Table 2 shows that, for all scales, the items loaded on their own scale and no other scale, except for Item 80 which had a loading of more than 0.30 with the OBE Familiarity scale as well as with its own scale (namely, Innovation). The percentage of variance varied from 4.5 to 13.6 for different scales, with the total variance accounted for being 45.8%. The internal consistency (Cronbach alpha reliability coefficient) for each scale of the SLEQSA ranged from 0.69 to 0.92 with the individual as the unit of analysis. To ascertain whether each SLEQ scale was able to differentiate between the perceptions of teachers in different schools, an analysis of variance (ANOVA) was calculated for each scale. The ANOVA results indicated that, with the exception of Innovation, each scale was able to differentiate significantly (p < 0.01) between the perceptions of teachers in different South African high schools. Overall, the results of the analysis suggest satisfactory reliability and validity for this version of the SLEQ-SA when used with science teachers in South Africa. To investigate associations between the environment created at the school level and environment created by teachers at the classroom level, simple correlation and multiple regressions were used. To assess the school-level environment, as perceived by the teachers, the SLEQ-SA was used to assess the seven scales of Familiarity with OBE, Resource Adequacy, Work Pressure, Student Support, Parental Involvement, Collegiality and Innovation. To assess the classroom-level environment, as perceived by the students, the OBLEQ was used to assess the six scales of Involvement/Investigation, Cooperation, Equity, Differentiation, Personal Relevance and Responsibility for Learning. The sample involved 50 science teachers in 50 schools who responded to the SLEQ-SA. For each teacher, the students in one of his or her science classes completed the OBLEQ. The school mean was used as the unit of analysis for the student data to enable matched pairs of student and teacher data to be used. Table 3 shows that only three of the 42 simple correlations between the six classroom environment scales and seven school environment scales were statistically significant (p < 0.05). Collegiality was negatively and significantly correlated with the classroom environment scale of Differentiation and Innovation was positively and significantly related with the classroom environment scales of Involvement/Investigation and Cooperation. Table 3 also shows that four of the six multiple correlations were significant for the analysis involving students' perceptions of the classroom environment, these being for Cooperation, Equity, Differentiation and Responsibility for Learning. The standardised regression coefficients were used to identify which of the individual school environment scales were significant independent predictors of a classroom environment dimension; Collegiality (with Cooperation and Differentiation) and Innovation (with Involvement/Investigation, Cooperation, Equity, Differentiation and Responsibility for Learning. All significant correlations were positive with the exception of Collegiality with Differentiation. The results suggest that schools in which teachers were encouraged to be more innovative also had classroom environments that emphasised involvement/investigation, cooperation, equity, differentiation, and responsibility for learning. Schools in which teachers were more collegial had classroom environments that emphasised cooperation, equity, and responsibility for learning. It was interesting to note, however, that schools in which there was increased collegiality, there was less classroom differentiation. This is the first study in South Africa that has attempted to bring together the fields of classroom environment and school environment. The two instruments were developed to ensure that scales were appropriate for use in South Africa and in line with Curriculum 2005 (Aldridge et al., 2006a; 2006b). The scales in the two instruments exhibited satisfactory factorial validity and internal consistency reliability and were able to differentiate between classrooms and schools. This study revealed some interesting tentative relationships between specific school and classroomenvironment dimensions. For example, the correlation involving teacher perceptions of school environment and student perceptions of classroomenvironment revealed asignificant positive relationship between the extent to which the school encouraged teachers to be innovative and the extent to which students perceived a classroom environment that includes pedagogy that is more outcomes-based (including Involvement/Investigation, Cooperation, Equity, Differentiation and Responsibility for Learning). Similarly, a school environment in which teachers perceived positive relationships with other teachers (Collegiality) was linked with students' perceptions of classroom emphasis on aspects of outcomes-based pedagogy (Cooperation, Equity and Responsibility for Learning). It is interesting to note, however, that teachers' perceptions of greater Collegiality were associated with less classroom Differentiation as perceived by students. Despite these specific results, the present research suggests overall that the school environment is not a strong influence on what happens in classrooms. Although some past research has suggested a link between the school-level environment and student outcomes (Anderson et al., 2008; Brookover et al., 1978; Cohen et al., 2009; Vyskocil & Goens, 1979), the weak relationships found in our study replicate those of Dorman et al. (1997) who found that the classroomwas somewhat insulated from the influence of the school-level environment. In this study, the questionnaires were administered as teachers were grappling with the implementation of outcomes-based curriculum in South Africa. Research indicates that teachers who are resistant to change are unlikely to modify their behaviours despite the introduction of a new curriculum (Fink, 1999). If teachers are indeed resilient to change, then the research reported in this article suggests that a top-down approach (as mandated by Curriculum 2005 in South Africa) might not lead to changes in teachers' existing patterns of behaviour. Not only is the school environment an integral aspect of the curriculum change process (e.g. Dora, 2005), but much research in the field of learning environments has shown a consistent relationship between the learning environment and student outcomes (Fraser, 2007). However, the results of this research suggest that what happens at the classroom level could be largely insulated against changes at the school level. Although the organisational climate of a school (as assessed using the SLEQ-SA) is important during the implementation of a new curriculum and for school improvement, our results suggest that it is unlikely that these factors will influence changes in an individual teacher's behaviour. In conclusion, therefore, the relatively weak associations between the school-level and classroom-level environments possibly could suggest that successful implementation of OBE might rest more on the professional development of individual teachers in a bottom-up approach. Jill Aldridge is Associate Professor at the Science and Mathematics Education Centre at Curtin University of Technology, Australia. Her research focuses on teaching and learning, especially the use of teacher professional development and action research as meaningful tools for improvement. Barry Fraser is Professor and Director of the Science and Mathematics Education Centre at Curtin University of Technology, Australia. He is Editor of Springer's Learning Environments Research: An International Journal. Rüdiger Laugksch is Associate Professor and Director of the School of Education at the Universityof Cape Town. His research interests include science teacher development, learning environments, and teaching and learning in science.